Commonly mounted directly on a truck chassis, the Hi-Way® E3020 features a wide conveyor allowing extra payload and reduced material bridging. It comes standard with a heavy-duty 10-gauge hopper with 7-gauge conveyor bottom and sills; a 30" (76cm) wide pintle chain conveyor system; and a fully enclosed hydraulic drive spinner with two internal deflectors. 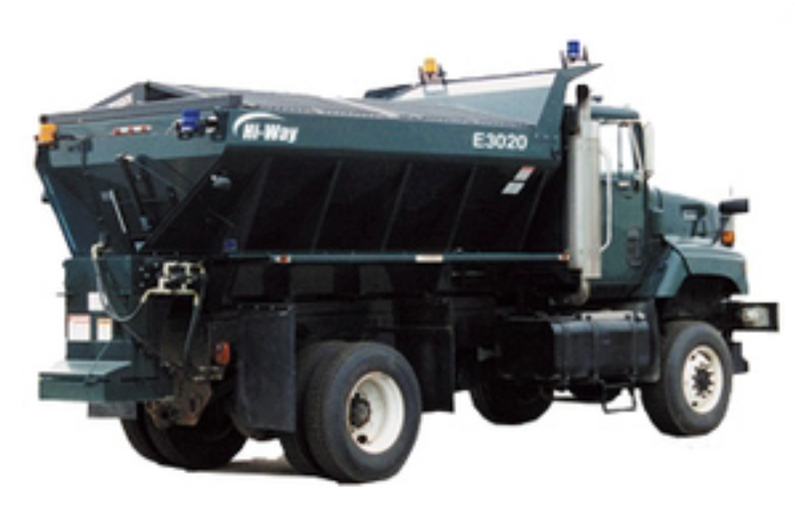 As a dump/spreader, the E3020 includes a manually-operated swinging rear endgate that allows for controlled material flow and high-speed no-hoist dumping. It also features a high-torque/high-speed conveyor selector valve, in-cab control valve with independent control of conveyor and spinner, built-in relief valve, and a 20-gallon (75.7 liters) reservoir with filter and indicator with hoses and fittings. Optional equipment for the E3020 includes a #4 belt-over-chain conveyor or a #4 hi-temp belt-over-chain conveyor with wide temperature range for handling hot asphalt mix and/or petroleum-based products. Fenders, mud flaps, cab shield, lights and screens are just some of the other available options for the E3020.